You remember my recent interview with author Barbara G. Tarn? Well, she also interviewed me and it was just awesome. If you’d like to check out the full interview, check out her blog, it’s got some great stuff on it! 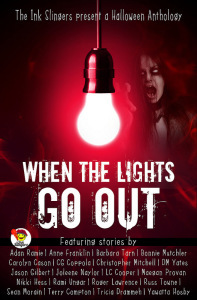 And as always, check out When The Lights Go Out, where you can find creepy stories from the both of us within. Now available on Amazon, Smashwords, B&N, Kobo, and iTunes. It’s the perfect reading for getting into the Halloween season. And it’s a guest! From the Ink Slingers Halloween Anthology but he was also in last year’s anthology! When I read “Travelers”, I thought I wanted to know more about the guy, but look, almost a year went by and… he did it again! His “Tigress Lizzy” gave me the right chills at the right times… so go grab your copy right now! Ladies and gentlemen, please welcome Rami Ungar! I’m originally from Columbus, Ohio, though for the past two and a half months I’ve been living and working as an intern with the US Army in Wiesbaden, Germany. As to where I write, anyplace I can plug in my laptop and let my creative juices flow, whether that be at home, in a café, a library, or even in the office when there’s nothing going on (rare moments, I tell you).